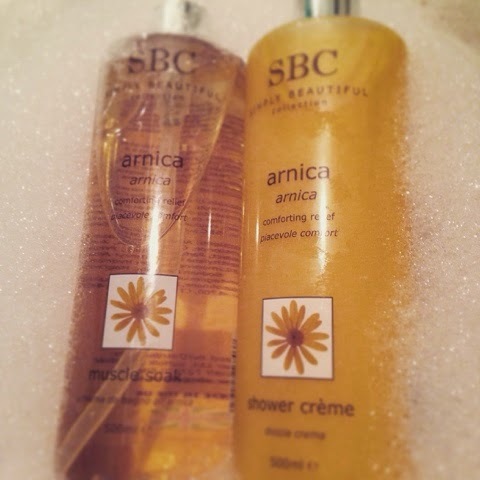 Time to relax with SBC ARNICA bath soak……. SBC Arnica Muscle Soak & Arnica bath & Shower crème! Oh Arnica …..How do I love thee? … Let me count the ways! If you thought you knew all there was to know about Arnica then think again! Simply Beautiful Cosmetics – SBC – is a fantastic British brand which has drawn on over 25 years of knowledge and experience to create powerfully active, natural and professional quality skincare. If you love your Beauty products to have a more simplistic look about them, the packaging on this rainbow coloured range of products will suit you perfectly. Clean, simple, practical packaging is used throughout which is brilliant as it means more has been spent sourcing the amazing ingredients instead. Originally made in huge sizes for salons only, as a beauty therapist secret we are now lucky enough to have access to this fantastic range that really nurtures and looks after our skin. Arnica is an amazing part of this range and is available in many guises. My Family and I absolutely Love Arnica, we love the Arnica Gel and the more Intensive warming gel and recently discovered the Arnica Bath and Shower crème! There really is nothing better on a cold, damp miserable day, than a warming, comforting Arnica bath. I find that adding a couple of pumps of the Bath soak to warm running water creates a lovely soft foam and a soothing bath that envelops me in a gorgeous warmth. When my family have aches or pains, coughs or colds and just need to feel relaxed and relived of tension there really is nothing better than slipping into this comforting bath. It really does help alleviate aches and muscles tension and also works brilliantly in a foot spa or a huge bowl of warm water for a relaxing foot soak at the end of a busy day. Recently I have added the Arnica Shower Crème to my repertoire and now my Arnica mission is complete, heaven in a bath! I have discovered that when I am really suffering with tension headaches or aches and pains across my shoulders and neck, whilst laying in the bath I put a couple of pumps of this gorgeous lavender and rosemary essential oil infused crème onto a clean cloth add a touch of water, lay it across my shoulders and just relax. As a shower crème you may think the Arnica may not be very beneficial this way, personally I really find its benefits great, used on a sponge to wash the body, whilst paying attention to those more tender, painful areas such as the back of the calves and shoulders, feet and arms, the almost prescriptive ingredients really sink in and leave me feeling revived and relaxed. My children love using it especially after playing lots of sport or a great family day out sightseeing and having fun and my husband genuinely used this range ( after consulting his physiotherapist) on a daily basis to soak his leg in after a serious accident. I would love to know how you use Arnica?